Fred Perrin doesn’t sit still, figuratively or physically. He’s perpetually in motion, like a bullet-train picking up speed as evidenced by his resume. Fred has been a world-vetted Tae Kwon Do and stick-fighting champion, a French Army Commando, professional writer, martial arts instructor and one of France’s most recognized professional knifemakers and he’s only in his forties. 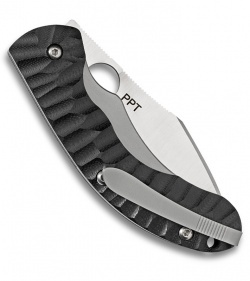 Full of innovation, his recent alliance with Spyderco results in the Perrin PPT folder. P.P.T. refers to the folder’s three designers; Fred Perrin, Philippe Perotti and Sacha Thiel. The lock is a crossbreed annexing components of both Michael Walker’s LinerLock® and Chris Reeve’s Reeve Integral Lock. 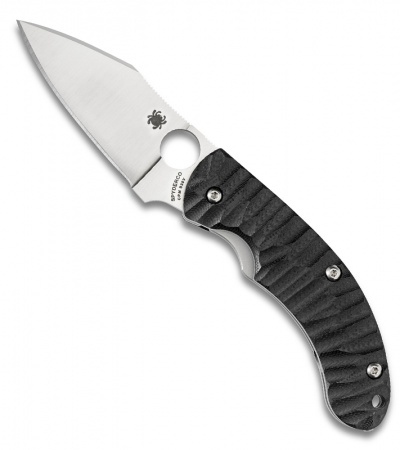 It functions as a frame-lock but a black G-10 scale overlaying the lock makes it appear closer to a LinerLock. The black G-10 handle scales are milled with corrugated creases for skid-free and ergonomic handling. Its full-flat ground CPM-S30V steel blade is a modified-Wharncliffe profile with a finger choil and spine jimping and a tapered spine-swedge. Screw together construction makes cleaning and adjustments simple. Left/right deep-carry pocket clip and handle lanyard open the door for endless attachment options.